Originally I wasn’t going to post this story because I am not a huge fan of Walmart but after further investigation I realized that this actually makes them look like idiots. 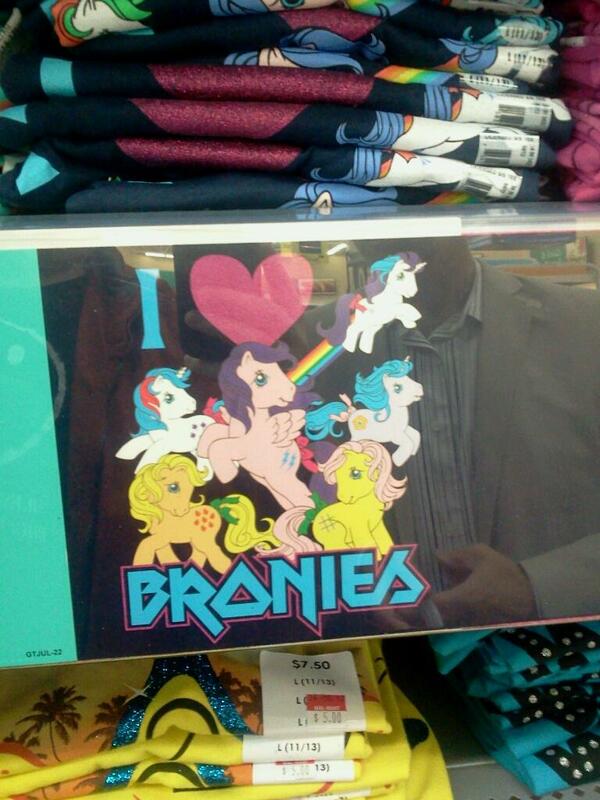 Here’s what went down, Walmart caught wind of the ever growing popularity of My Little Pony: Friendship is Magic, and wanted to capitalize on it, specifically on the brony subculture, so they came out with an I Heart Bronies t-shirt, but to quote Arrested Development “they’ve made a terrible mistake”. What Walmart doesn’t understand is that the brony subculture revolves around the rebooted MLP series (started in 2010) not the original from the 80s, which as you can tell from the imagery and text is what Walmart used. I love a good 80s style shirt more than anyone but in this case it just doesn’t work. Next time Walmart, do your research! COME ON!